Went over to my good friend Sarah's today and did some craftin' and paintin'! 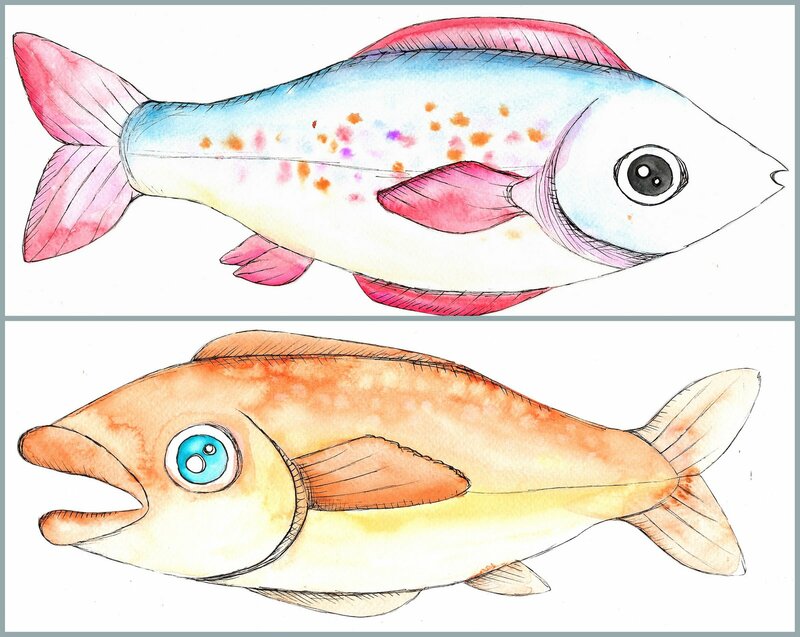 We painted some fish for an under the sea display at the local library and these are the two fishies I came up with. They're the biggest things I've painted in a long time! About 12 inches long! My favorite is the blue one up top, but I'm at my wits end trying to photograph my paintings correctly. This pic is a scan, which I think washes a lot of the color out... I need to fiddle with the settings or something. Scanning makes the whites very white, but the colors get very washed out, especially greens. Meh. Happy Tuesday to you. It's funny how much the personalities change with and without the fish lips! Very cute! Are you missing the Pacific northwest? :D I miss the PNW all the time... And the fresh seafood. Those fish look tasty, right?